UPDATE 12 March 2019: New trailer for Aladdin! Check it out below. I don’t care what anyone else thinks, I like it. And if no one else goes to see it at least I can sit in the cinema in glorious solitude, singing “A WHOLE NEW WORRRLLLLDDDDDDD…” without worrying about scaring anyone else there. The film stars Mena Massoud as Aladdin and Naomi Scott as Princess Jasmine, with Marwan Kenzari as Jafar. It comes out in the UK and US on 24 May 2019. A new “special look” clip has been aired on US TV for the upcoming live action version of Aladdin, directed by Guy Ritchie. 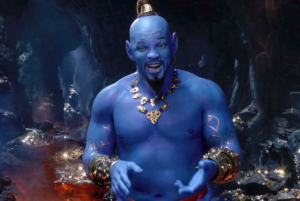 The film, and particularly Will Smith’s Genie, have attracted some flack. To be fair, he does look like he’s escaped from Willy Wonka’s chocolate factory after eating something he shouldn’t. Smith is certainly playing the Genie as a bit of a joker. (That’s joker not Joker.) Though it was always going to be difficult to step into Robin Williams’ shoes. I do like how the film looks though – the gorgeous, rich colours and the gold lettering blowing away like sand in the desert.